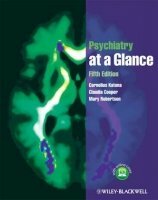 Psychiatry at a Glance is an easy-to-use, accessible introductory and study text for all students of psychiatry. It helps develop your skills in history taking and performing the Mental State Examination (MSE), and presents ‘need to know’ information on the basic science, treatment, and management of the major disorders. This edition features: Thoroughly updated and reorganised artwork, offering greater clarity and easier understanding for those new to the subject Greater emphasis on history taking and examination - essential for clinical work and clerking patients New chapters on mental health capacity and coverage of the Australian and New Zealand health care legislation Even more Extended Matching Questions, brand new Single Best Answer Questions, and sample OSCE stations so you can test your knowledge A brand new companion website at www.ataglanceseries.com/psychiatry, featuring updated case studies and downloadable illustrations.